Deacon Kurt was using SquareSpace and wanted to migrate all of his existing content (including his 6 blogs) over to WordPress. Already decided on utilizing a premium theme, Deacon Kurt looked to KornDev to provide guidance on selecting a theme, getting the theme setup and running, migrating all of his past data from SquareSpace to WordPress, and a basic walk through of how everything worked. 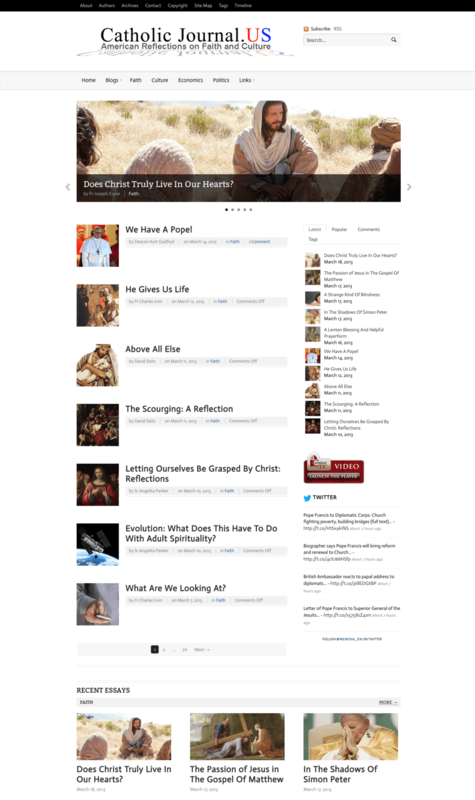 After a few discussions and better understanding the needs for catholicjournal.us, we narrowed it down and recommended Currents by WooThemes as the theme for the new WordPress based home. Within 2 weeks, we had all of his past content transfered, his new theme setup exactly how he wanted, had Deacon Kurt trained and ready to master WordPress content editing, and launched live. Catholicjournal.us is now benefiting from a maintenance package in order to ensure the WordPress files and plugins are kept up-to-date, the database is optimized, and the entire site is backed up and tuned regularly.